The alarm went off at 5:00AM to rouse us from our sleep. 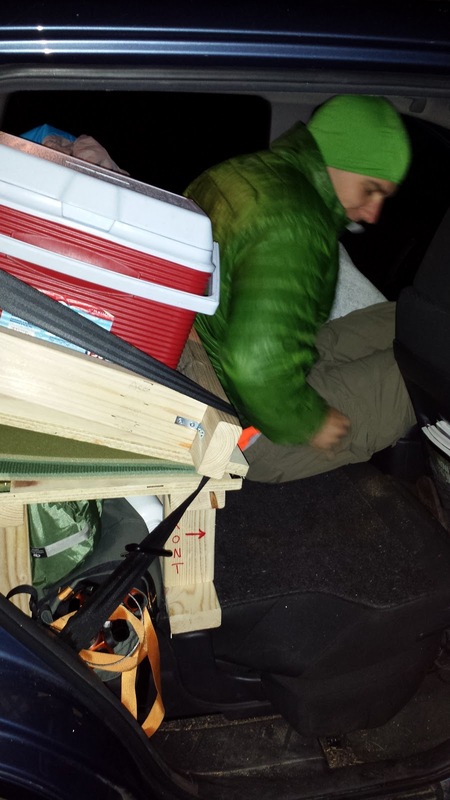 We quickly dressed, brushed teeth, and grabbed the day’s food from the bear box before hopping in the car. 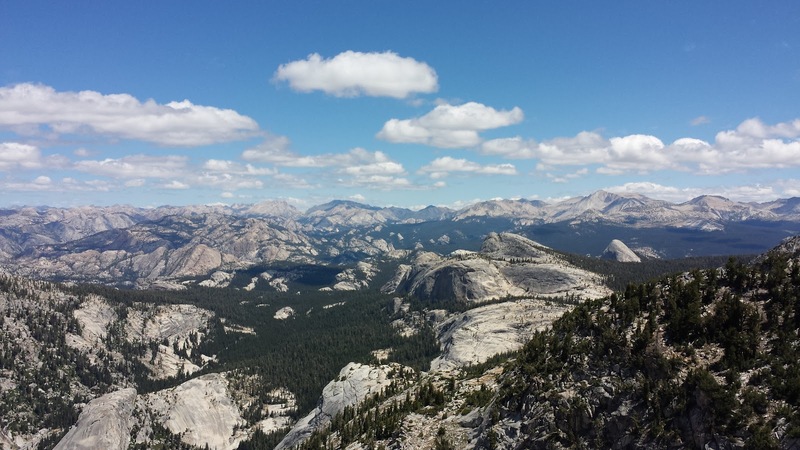 We drove towards the parking area on the northeast shore of Tenaya Lake, eating our breakfast of peanut butter and jelly on cinnamon raisin bagels. 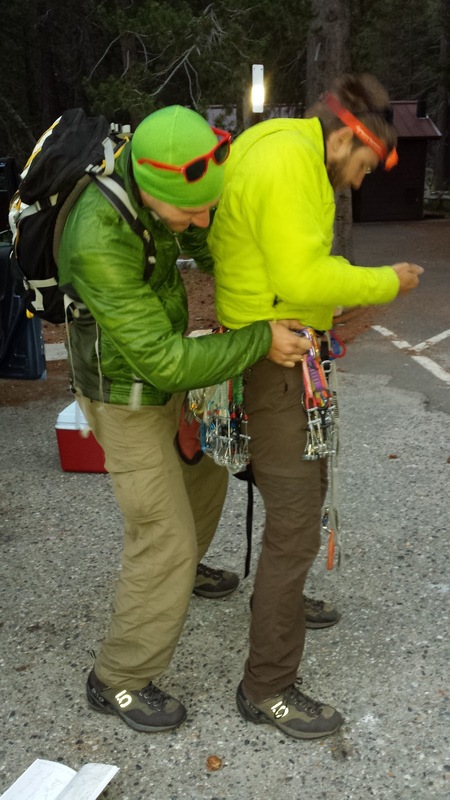 Around 6:00AM we were navigating along the climber trails towards the granite slabs at the base of Tenaya Peak. We scrambled up for a few hundred feet until the slop became worthy of roping up for some simul-climbing. We simuled for a few hundred feet of climbing before setting up belays. The weather was fantastic and our spirits were high. We were the first climbers on the route and we did not see another party until a group of two appeared behind us and we started to belay. A few pitches later, around 9:30AM, we stopped on a large ledge for “lunch,” a second round of peanut butter and jelly on cinnamon raisin bagels. We let the group of two pass before moved on. As Doug belayed Dave up the next pitch, Alex looked at the guidebook and realized we had made excellent progress. It looked as if we were already at the top of pitch 12. That left 2 more pitches before a scramble to the true summit. Doug apparently forgot to tell Dave when he reached half rope, so when Dave yelled down asking about it, Doug said “You have 4 feet to me!” Dave mistook this for “You have 4 feet to the middle” and was surprised that he still had so much rope left. Dave was not at a place he could set a belay, so Doug scrambled up a few feet to give Dave more rope to work with, while Alex had him on belay. Dave set a belay and now Doug was double belayed. When all three of us rejoined at the belay Dave set, we let a free-soloist pass through the loose blocky area ahead before we moved on. Above the blocky section, we found a fantastic 5.7 hand crack to finish the climbing of the route. Our only wish was that the crack had been longer! 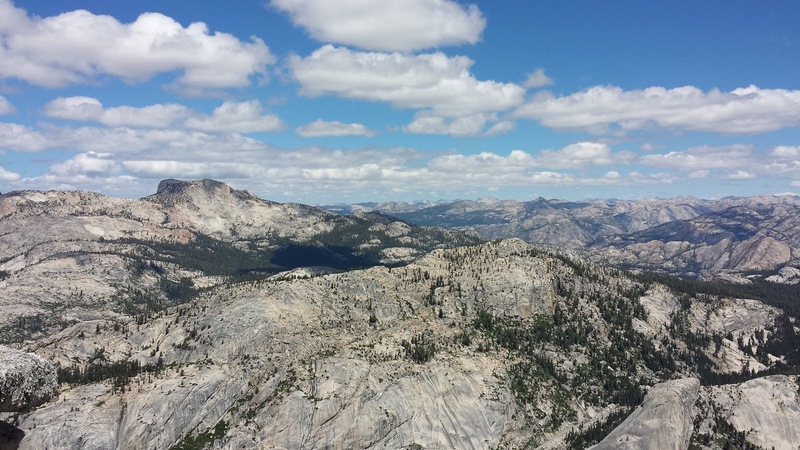 We scrambled to the summit to take in the amazing 360 degree views, have a snack and take some pictures. We were on the summit by noon, had never taken off our approach shoes, and had a fantastic day of climbing! We navigated our way down to sloping slabs on the northeast side of the peak and around to the back side of it. 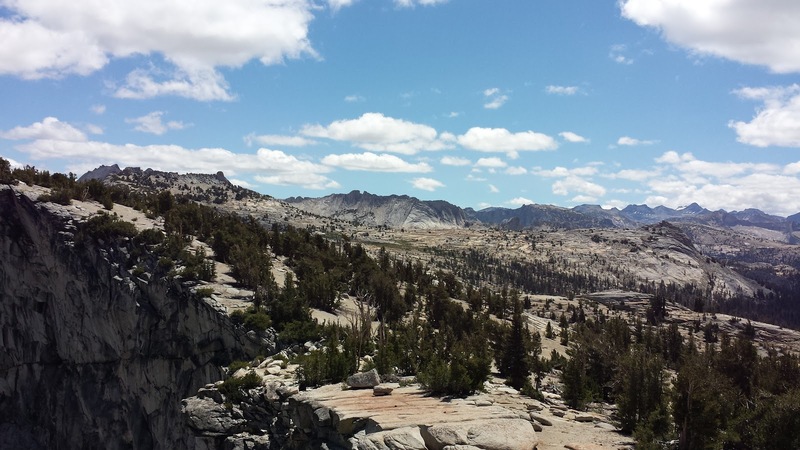 We would need to hike down and around the backside of the peak, which would take us to the opposite side of Tenaya Lake from where we parked. On our way down we spotted two large birds (wild chickens, alpine hens, mountain chickens…) and of course Doug took pursuit of “dinner.” Birdless we made our way over the granite slabs, through the woods, and across fallen trees (aka log rides) until the sounds of people on the shores of Tenaya Lake could finally be heard. We followed the official trail, putting running girls in bikinis within eyeshot of cheerful Dave and Doug, until we found ourselves back at the road near Sunrise trailhead. A perfectly timed park shuttle showed up and saved us from the long walk up the road to our parking area. We cheerfully thanked the driver for his impeccable timing as he drove us towards our parking area. 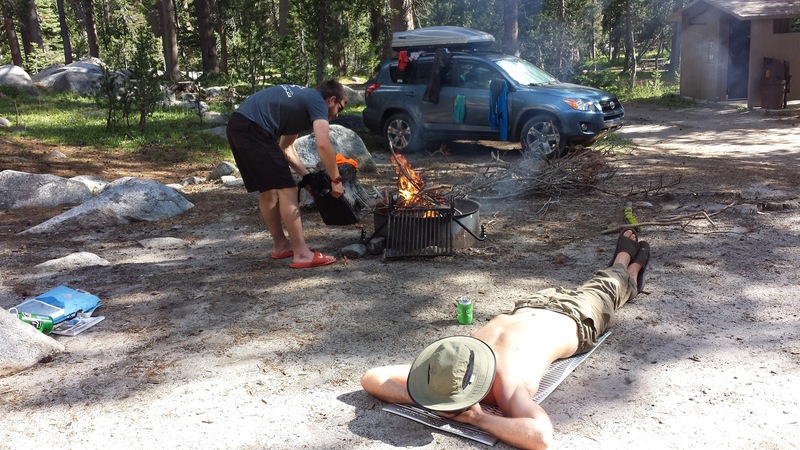 We stopped at the camp store for a few dinner supplies, and mauled a bag of Doritos in the parking lot. 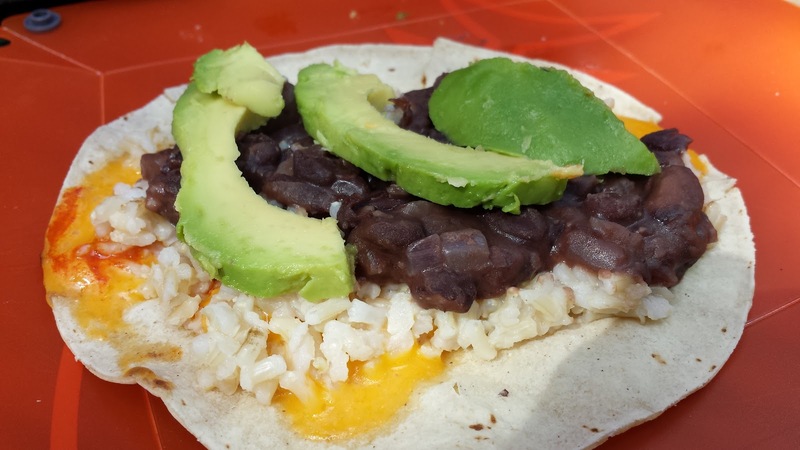 Back at camp, we cooked up tortillas topped with cheese, hot sauce, rice, onions cooked with black beans, and avocado. The rest of the day was spent lounging and napping before we scavenged some additional firewood from the woods behind our site. 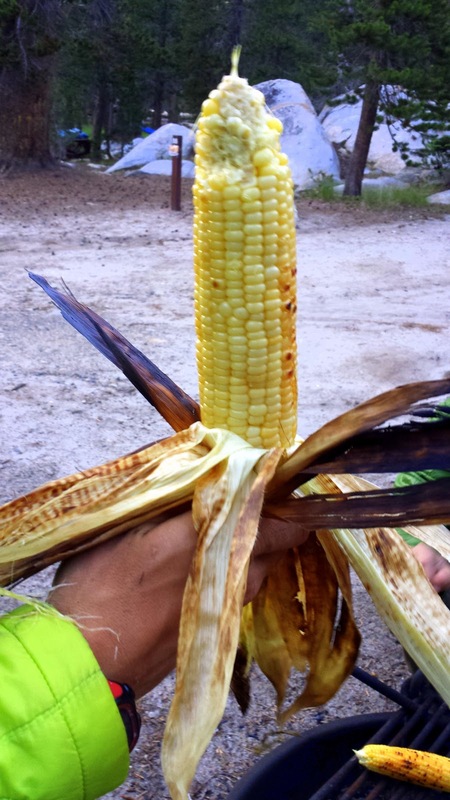 We had an evening snack of corn cooked over the campfire… it was delicious! Sleepily we headed off to bed, cheerful that we would not have to awaken before the sun in the morning!